Let’s not mince words about it — The local real estate market in the Bay Area is going absolutely ballistic right now. Back in 2012, when I first started buying properties locally, I thought that each and every open house was an insane mad house with too many eager buyers wiling to do whatever it took to secure a deal. 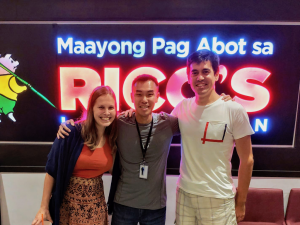 Over the next few years, the flurry of interest has remained strong, but during the end of last year, I had this strong feeling that things were starting to taper off a little bit. When I was looking for properties to buy last summer, yes there was interest in the air, but it really did not seem like I had to overbid significantly to win Side Hustle #1, Side Hustle #2. In fact, most recently with Side Hustle #3, we won the deal at $10,000 BELOW listing. As short back as this past November, there was almost zero interest for these types of properties. For SH #3, I think we competed with just 3 other buyers, and I even had difficulty finding anyone who wanted to partner up on this deal! The Fear Of Missing Out (FOMO). Like with anything in life, when you’re repeatedly told, over and over again, that your best is not good enough, it will make you hungrier and want to try even harder to succeed. With investing it’s no different, but a tad bit more simple — Throw in more money and remove even more contingencies in your offer. I’m willing to pay $X for your gorgeous home! However, if Buyer MB (money bags) comes along and offers $Y more, I’m willing to outbid him and pay $Z extra! In a previous post, I argued that cash flow is NOT always king, and that appreciation (to build wealth) is also important. In that article, I used a specific example to illustrate my point, showing how much interest a desirable property can receive in the open market. As mentioned previously, this particular property has a lot going for it. It’s located in a very good school district, is a single family home, is strategically centered around many high-tech jobs, and provides nearby access to many major freeways. The listing price was reasonable, and if you had asked me earlier, I would have guessed that the property had enough potential to sell for about $700,000. Anything higher than that, I think the numbers just don’t make any sense, since renting would obviously be cheaper than buying. At $700,000 purchase price, the cash flow numbers don’t look attractive, but the total monthly payment isn’t world’s apart from what rent would fetch out in the open market. As a homebuyer, you could argue that this deal makes some sense because at least if you purchased as an owner occupant you would be building up equity (paying down principal) every month. Further, because the house has all the characteristics of a Class A property, you could easily argue that it has a good chance of appreciating further into the future. For an investor, all I see is a lot of RED. If I was looking at such a property for a Buy and Hold, I would never even consider it; there’s no layer of protection offered, and another market crash would easily wipe out all your equity. Further, the above analysis assumed a massive downpayment of $175,000, which is a huge sum of money to be depositing into a cash flow NEGATIVE investment. Market conditions will always dictate what moves you can make as an investor, so always stay open-minded and fluid. But even early on in late 2012, I realized that cash flow was tough to find in desirable single family homes. Ever since I started investing in Bay Area properties, my “sweet spot” strategy has always been to purchase quality townhouses for under $500,000. 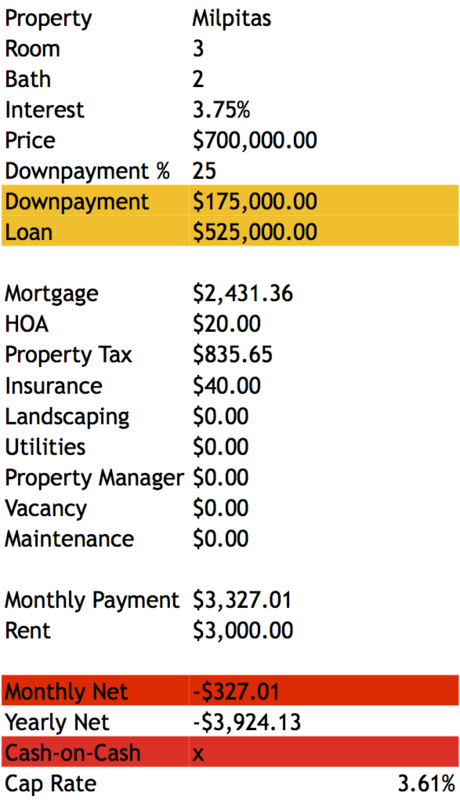 Above that price point, the cash flow numbers rarely (if ever) work out… The combination of: higher mortgage payment, increase in property taxes, and rent ceiling (market rent can only be set so high…) creates a sort of triple whammy that all serve to minimize cash flow. The numbers crunched above were realistic numbers and what comps were selling for at the conclusion of 2014, and even into early 2015. Now that buying season is ramping up, the landscape has changed yet again. 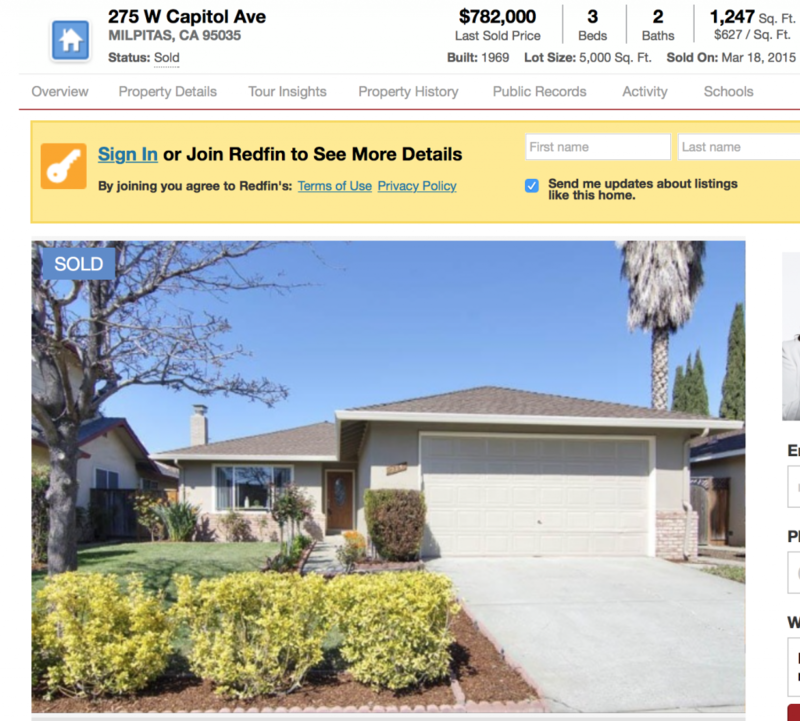 To continue my point regarding the absurd overbidding that is going on in the local market right now, here’s an update on that Bay Area home in Milpitas — After all was said and done, that $675,000 single family home ended up selling for $782,000. 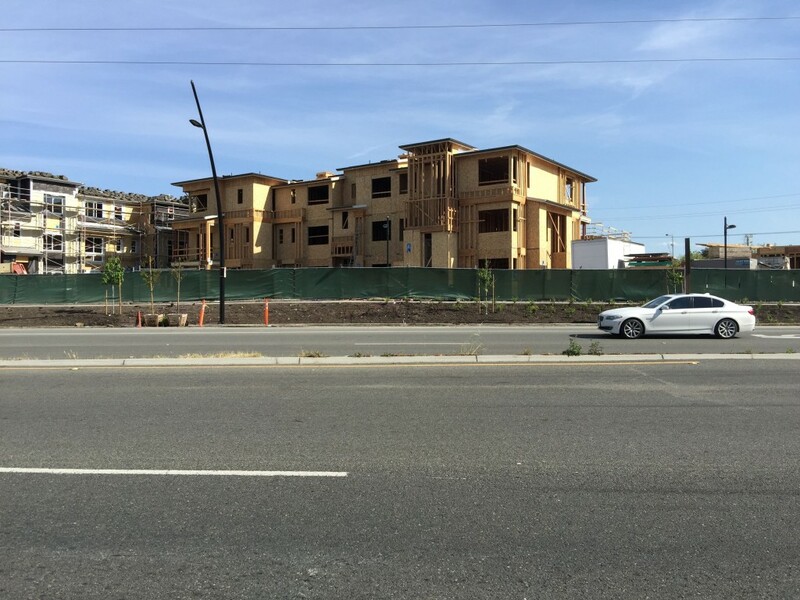 That’s right… In 2015, 3 years after the recovery (bull run) started, we are STILL seeing properties selling for over $100,000 above list price… And we aren’t talking about Palo Alto or Mountain View here… This is happening in the lower-tier cities such as Milpitas! The divide between monthly payments and market rent just keeps getting wider and wider… We are talking bout a difference of over $700/month which is NOT chump change. At this point in the housing cycle, as a homeowner, you are paying a hefty premium to be able to call a property your “own home”. It is far cheaper to rent than it is to buy today! As an investor, upon seeing these numbers, I would run for the hills… Or at least seriously contemplate selling my own properties. If the market has not reached fever pitch yet, look out below when it does! The Fear Of Missing Out and the irrational exuberance it brings along is something we must all fear. Although mortgage lending is still pretty tight today, lenders are loosening up, and are giving people far too much credit by pre-approving loan amounts that they are not qualified for. Sure, it feels good when the bank tells me that I’m pre-approved to buy up to $700,000, but even I know that I’m ill-equipped to take on so much debt (at least without having someone else paying it off for me, which I can’t anymore today because cash flow numbers no longer work!). It’s always important to take a step back and analyze for ourselves what is going on behind the numbers. Ignore the bidding wars. Ignore the open house crowds. Ignore all the insanity surrounding you! It is possible to make money in an upmarket (greed), but you make far, far more in a downmarket (fear). Why take unnecessary risks? What goes up will always come crashing back down again, eventually. Perhaps the above statement is oversimplified (out-of-state investing involves work too! ), but I do understand the angle where he is coming from. Yes, to me it makes sense that if your own financial situation is abundant (and so are all of the houses around you), that you try and locate a marketplace where assets are reasonably discounted (relatively speaking). And that’s what I tried to do myself in 2013 when I first went out-of-state to purchase turnkey properties. I can verify what this guy is saying too, because I know very well that my own out-of-state investments have experienced hardly any appreciation since I closed escrow in 2013/2014. But hey, if you’re looking for cash flow and don’t care for appreciation, then the downside risks of going out-of-state may be significantly less if you buy right. I’ve admitted that I’m a fan of appreciation, but c’mon at $782,000 (and $100,000 above listing), even I have my limits! Appreciation is most potent when you buy at market lows, not when you are setting all-time-high records. To expect even more appreciation above this new benchmark would be tough and unrealistic; you’ll most likely need to wait out many more years for earned income to catch up to support this level. This sale will no doubt raise comps, but you’ll need a lot more comps to come up to justify this premium! With markets like the Midwest, unlike the Bay Area, your increase in buying power will actually help make a positive difference; By going out-of-state, you’ll be able to gobble up a ton more properties that actually cash flow! Many Bay Area investors have indeed adopted this approach and some have been doing this since the local upswing first resumed in late 2012. I know a few investors who have planted deep roots in Texas, purchasing as many at 15+ SFH over the last 3 years. I can’t deny it, part of me occasionally thinks about liquidating my Bay Area stock and using the capital gains to outright buy homes in other parts of the country. Thanks to things like 1031-Exchanges, there are conceivable ways to do it without incurring a massive tax hit. Or, you can take the path of least resistance and do what many other investors have elected to do — NOTHING. If you feel that real estate is expensive, stocks are expensive, and just about everything else is overpriced, there’s absolutely nothing wrong with stashing cash and sitting on the sidelines while you wait for a better opportunity to strike. In fact, this is basically the option I’m electing to take. As mentioned many times before, it’s just simply more fun to be investing in a time of fear as opposed to greed. Since the start of 2012, I’ve gone head-first in my assault to buy up assets. It’s now spring of 2015 and the markets are very frothy again. I’ve made enough moves to be content with where I am today. Rationally speaking, it makes very little sense for me to keep investing in this type of market environment. Too much risk and not enough reward. It’s not a fun time to be an investor right now. But things will turn around at some point, they always do. Loved that line to close out the post. The FOMO is definitely a big issue regarding investing. I’m semi-battling with it right now myself. It’s getting very hard to find good values in the DG space and I want to continue to building up my portfolio, but there’s huge headwinds for the economy and stock market. That makes it difficult to move forward but there’s no sense in using up all available capital when better times could be just around the corner. That doesn’t mean that I won’t invest right now but I’m trying to stick with the highest quality companies out there for my investment capital. Yes, investing is pretty tough right now across the board. I recall rather vividly when we were both aggressively investing into dividend growth stocks back in 2012 and seemingly every week, we would have more and more stocks added to watch lists b/c there were so many abundant good deals. I’m with you on allocating capital to the best companies out there. In good times and bad, they will continue to find a way to generate revenue and make money. For DGIs, you will keep collecting paychecks like clockwork. 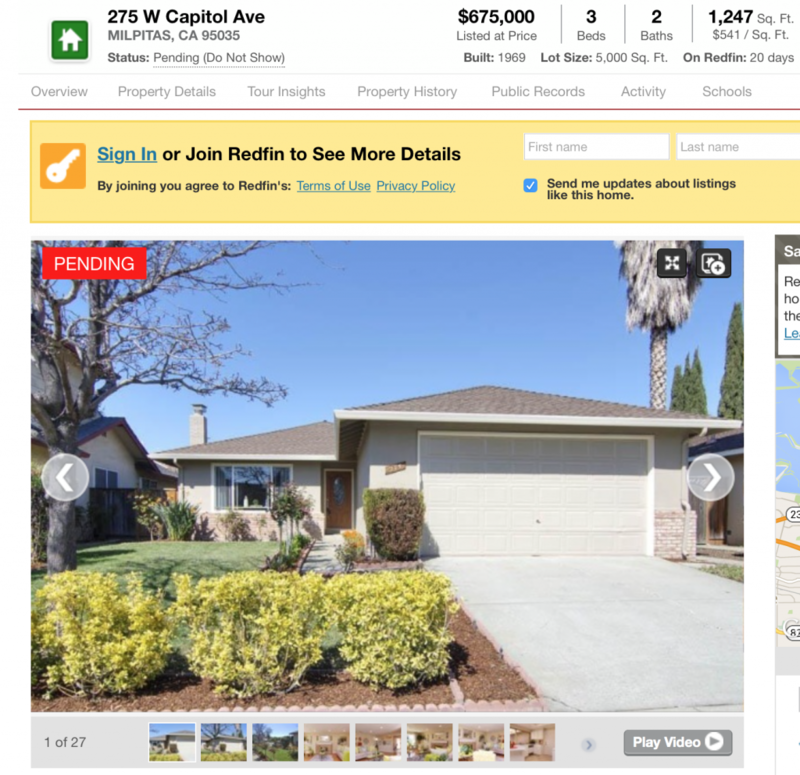 Do you have a walk away figure for your bay area properties? Everything has a price, what’s yours? The NYC real estate market is the same way. If you put 20% down on a rental property, you’ll actually lose money because the cap rates are so low. Everyone is betting on capital appreciation. Yeah, I’m definitely not surprised to hear that NYC is booming as well, it seems to always be. NYC and SF are very comparable when it comes too being super expensive! Yeah, finding cash flow with only 20% down is a real challenge in the Bay Area right now. It might be possible in certain pockets, but very tough in the South Bay, for sure. Appreciation is wonderful until it stops happening… And that tends to happen in an instant. I’m not counting on anymore of that moving forward. It’s not just the bay area that is too hot. I bought a SFH in Fort Worth 18 months ago, worth about 150k. I am selling it for a move for a job and was surprised to get an offer for 175k. I put some work into it, but not 25k worth by any stretch. Anyway, when all markets are too hot, paying off the mortgage is what I do. A guaranteed 4% return from debt paydown beats a probable loss from frothy markets. Thanks for sharing. I used “Bay Area” in the article since it shares my own personal experience with local real estate, but I’m certain that’s very relatable to many parts of the country (DFW, Austin, Seattle, NYC, etc.). You can simply replace the words “Bay Area” with your own local market and that’ll about sum up how insane things are at the moment. Paying down debt is never a bad thing, and it’s definitely the safer of the two approaches. Overbidding in a scorching hot market is usually how people get burned with investing. Good stuff! $40/month in 100% passive income is nothing to sneeze at, so it looks like your hard work paid off! I would love to do the same someday with an ebook of some sort. When properties are selling that much over listing, it must be a owner occupied home buyer purchasing it. An investor cannot compete with a person that is ‘in love’ with the property. Yes, these homes are catered to the owner occupied crowd, but I am seeing investors join in on the bidding wars for investment properties. A comp nearby SH #3 just sold for $100k over listing and it is being marketed as a rental. It’s a tough market for both crowds. oh-oh… here we go again! A new gold rush? I totally understand your FOMO feeling as I have similar with stocks or options. Sometimes I like a trade so much that I start to chase is and later realize that the premium I received is actually bad one and totally changes the risk/reward ratio and makes the trade a bad one. Terrible feeling. I still sometimes get into this trap when trying to recover the trade and the market goes against me. It’s called that you are in love with the stock or investment. Always a bad idea!!! Yes, always important not to fall in love with an investment. I’m trying to keep my senses during these insane times. I bid on one house that had an asking price of $1.2 million. It was priced artificially low by at least $150,000. I put in an offer for $1.5 million CASH, and got blown out of the water with the winner at $1.8 million cash! Furthermore, it’s been a year later and they are not yet done with a gut remodel. The house was PERFECTLY fine before the remodel! But the owner is putting in at least $350,000 into the house (i went inside). Now that is nuts.